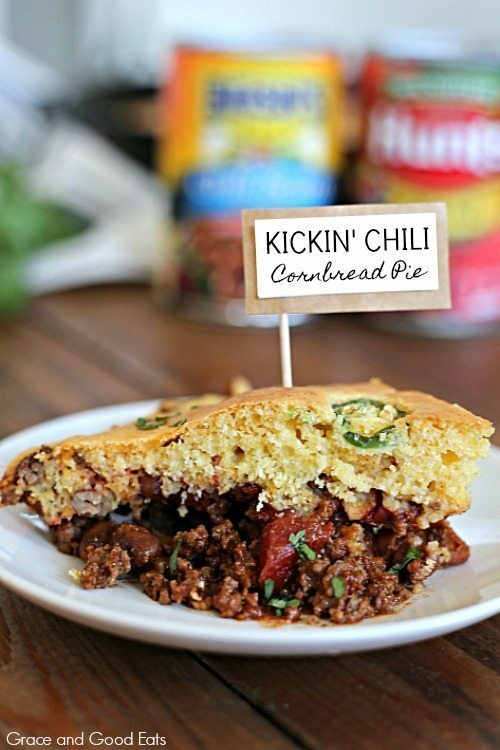 This Kickin’ Chili Cornbread Pie is hearty, meaty, spicy goodness. 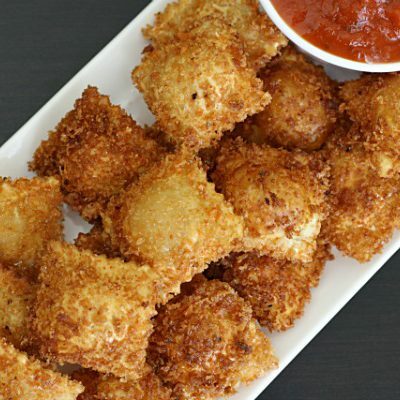 Perfect for a cold night and easy enough for a weeknight meal. 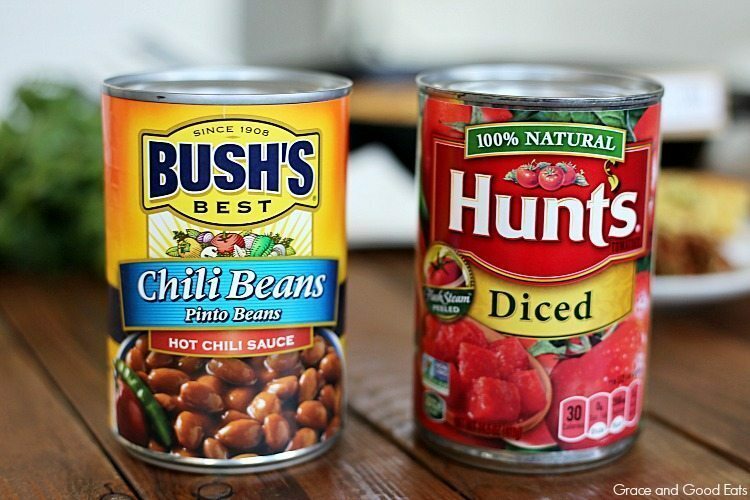 This is a sponsored post written by me on behalf of BUSH’s slow-simmered chili beans and Hunt’s vine ripened tomatoes. There is nothing better than a big bowl of warm chili that has been simmering all day with a side of cornbread on a cold night, unless it is a big bowl of chili AND cornbread together in a single skillet that that only took minutes to make. This Chili Cornbread Pie is loaded with hearty ground beef, BUSH’s slow-simmered chili beans, and Hunt’s vine ripened tomatoes. 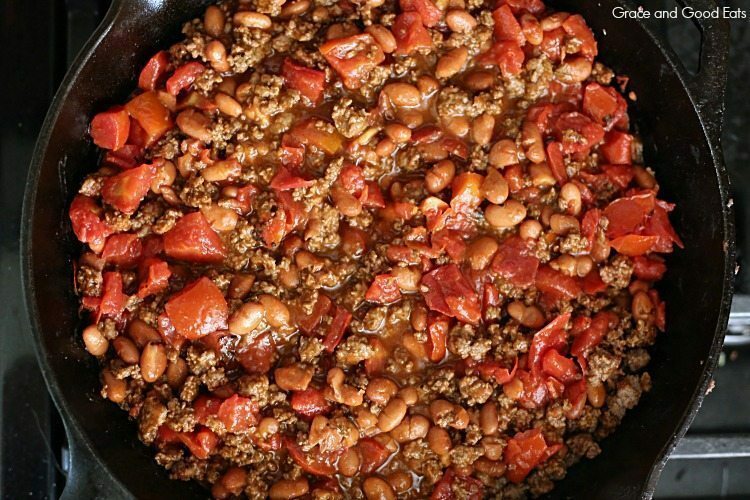 Here in the Lone Star State you won’t find many chili recipes that call for beans, as most Texans prefer something closer to chili con carne (chile peppers with meat). I think there is a time and place, and room on my table, for both. 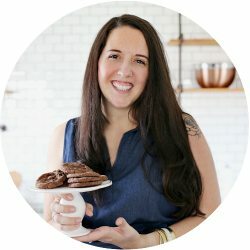 I might want a thinner meat only chili (like my homemade chili recipe) on things like hot dogs or over corn chips, but I love the texture and protein that beans add to a stand-alone bowl of chili. BUSH’s slow-simmered chili beans and Hunt’s vine ripened tomatoes are two essential ingredients in this Chili Cornbread Pie. 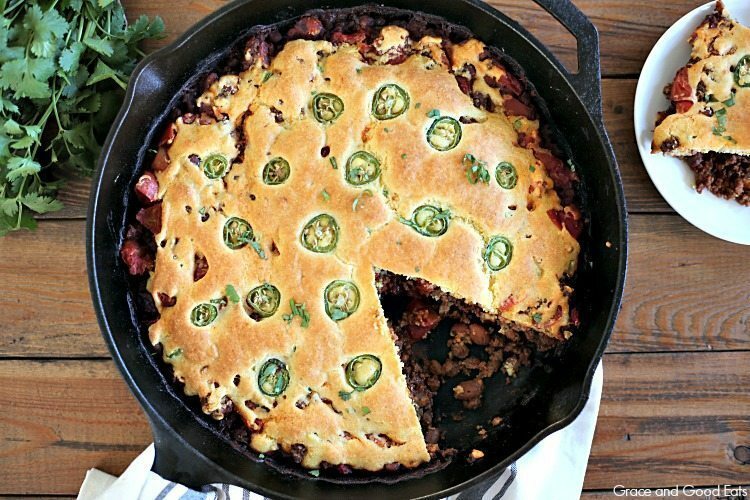 My family has lovingly nicknamed this recipe the “Kickin’ Chili Cornbread Pie” because of the kick that comes with all of the added spices and serrano peppers. 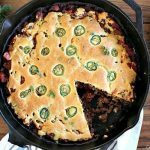 I love that this Chili Cornbread Pie is a one-dish recipe that can all be cooked in a single skillet. No need to dirty one pan for the chili and another for the cornbread. 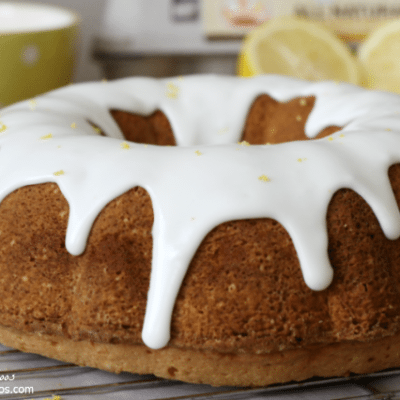 Everything bakes up nicely together and only requires a few minutes of active cooking. 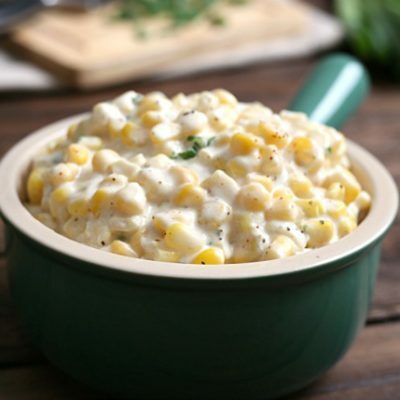 Serve with a dollop of sour cream or grated cheese! 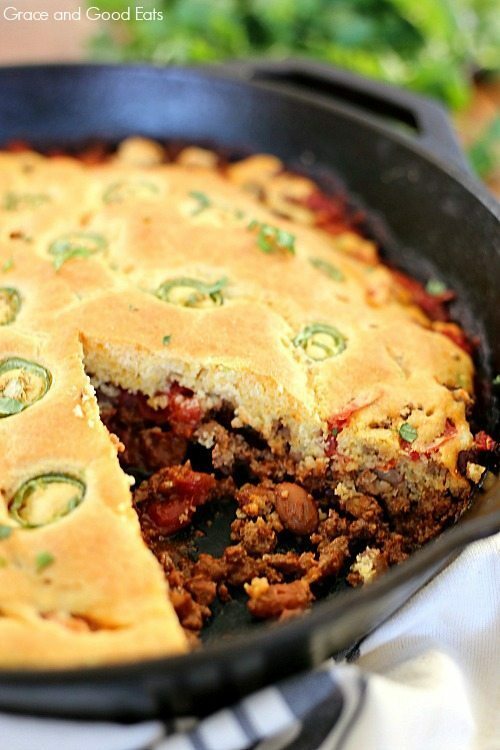 This Kickin' Chili Cornbread Pie is hearty, meaty, spicy goodness. Perfect for a cold night and easy enough for a weeknight meal. Fully cook the ground beef in a 12in oven-safe skillet. 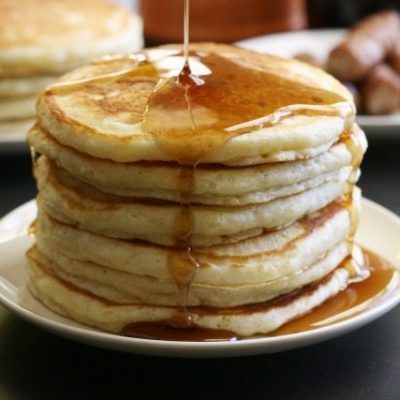 Once the meat is browned and fully cooked, discard any excess fat. Return the meat to the skillet and stir in all spices, tomatoes, and beans. Cook 3-5 minutes until the mixture is hot; remove from heat. 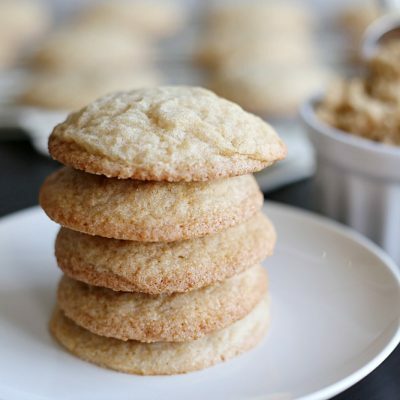 Whisk together cornmeal, flour, and baking powder. Fold in half of the serrano chilies and pour the batter over the beef mixture, spreading gently to cover. Top with remaining serranos before transferring the skillet to the oven. Bake 25 minutes, or until toothpick inserted into topping comes out clean. Let stand 10 minutes and garnish with cilantro if desired. This was spicy and good!